To the Moon and Mars! Real plans in 2018 if we act now. Thank you so much for your support in 2017! America's space program is at a historic turning point. Decades of started but cancelled plans, and decades of always pushing the Moon and Mars decades into the future CAN end now. If we act now. And the failed plans CAN be replaced with real plans and a real budget to build a Lunar base in the 2020s, and go to Mars in the 2030s. If we act now. The president's nominee for NASA Administrator has been approved in committee, but awaits final Senate approval. Your help is needed to get the votes necessary--call your Senators. Once in office, the Honorable Jim Bridenstine can roll up his sleeves, bypass the bureaucrats and bean counters, and free the engineers and commercial space to get us to the future we have hoped and dreamed for all these years. The Vice President is the chairman of the National Space Council. 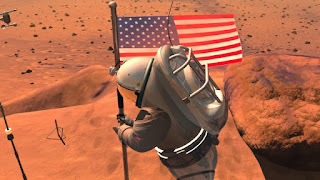 In coming months, the Council will report on the specifics of how we can return to the Moon and go to Mars--for real. The Council will bring together NASA, commercial space, industry and other stakeholders to unite and accomplish our objectives in human space exploration, and to free commercial space to reach new frontiers. As an indicator of the president's and vice president's determination to restore our space program, consider one of their first actions was to ask NASA engineers if the first SLS rocket launch could be manned. While the engineers decided that wouldn't be safe, this shows a serious desire by the administration to think outside the box, and to accelerate long-dormant and slow-rolled plans. But it all starts with your support. Please donate now to help make our long-postponed dreams finally become a reality. Save Manned Space remains your advocate in Washington. The Director helped write space policy for the president's campaign. He met with the president's and vice president's space advisors offering a detailed series of recommendations that would restore our space program. Save Manned Space is often in Congress meeting with members and key staff. We have helped lead the confirmation battle for Hon. Bridenstine as NASA Administrator with visits, working with pro-space groups, and even advocating to over 140 Washington-based political and grassroots organizations the importance of a solid confirmation vote by the Senate. The Director gave four speeches at the Mars Society's International Convention, reaching those who's voices are essential in uniting support for real missions to the Moon, Mars and beyond. Continued outreach this year to the media netted many radio interviews. Few if any others in the space advocacy field warn of the threats from China and other regimes that will use control of space as a weapon to block commercial space and NASA exploration alike. Some might say in this budget environment that Mars can wait. 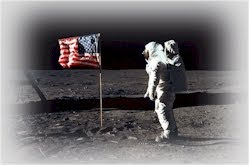 Or that we must settle for baby steps like missions around the Moon, but never land again on the Moon. This would surrender outer space to those who intend to deny our access. Time is indeed of the essence. That's why your donation now means so much. The upcoming battles in Congress to approve the changes that could put us on track to send Americans to the Moon and Mars after the NASA Administrator is confirmed will be incredibly difficult. There are real threats to a new space program that will take us to the Moon and Mars. One is entrenched bureaucrats loyal to the bureaucracy and not to a bold new space program. Another is a diversionary plan to build the 'Deep Space Gateway," which would be a lunar orbital base like a mini-ISS that would just orbit the Moon, allowing 'spectator seating to watch China build bases ON the surface of the Moon.' Yet another threat is perpetually-flat NASA budgets in spite of the space program yielding far greater returns to the economy than its budget (almost unheard of for any other program!). But there is hope. Real hope that for the first time in too many years, America can harness the American spirit and the and make real and fast progress. It's not the technology that's keeping us trapped in low earth orbit. After all, your phone has far more computing power than the Apollo lander did. It's political will. That's all. That's why advocacy organizations like Save Manned Space are essential in building support. Please donate now to help Save Manned Space offer the necessary public support. Donations are not tax deductible because we lobby Congress on your behalf. Please add your support now for a bold new space program. $5, $25, $50 or even $5,000--it all adds up and makes a great difference. Thank you very much for making a difference.